New Zealand is known for the beauty of its nature, the pristine blue waters of rivers and impressive mountains. But this country is not just great outdoors and flocks of sheep. The cities are the pride of New Zealand and are distinguished by their architecture, culture and history. Here’s our list of the “top 5”. 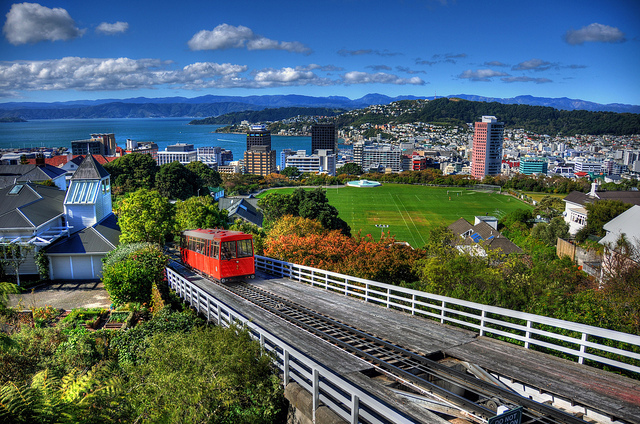 The capital of New Zealand is located between beautiful hills and a lovely harbor. The center of the city is small enough to be visited by foot. Wellington is home of the “Te Papa Tongarewa” : the national museum which tells the story of New Zealand through exhibits and interactive displays. In this city you will discover a surprising variety of art galleries, theaters, clubs, attractions and an active nightlife. – visiting the “Museum of Wellington City” to complete the cultural journey that begins at the museum “Te Papa Tongarewa”. Dunedin is located in the South of the island and it was built at the base of an ancient extinct volcano, situated in the Gulf of Otago. There are many places to visit and possible activities in this city. – admiring the Larnach Castle : from the highest point of the peninsula you can visit this castle, built by the extravert banker and politician William Larnach in 1871 to impress the nobility of the time. It’s well worth a visit. This city is located south of the homonym lake in the region called “Bay of Plenty”. It’s a charming and quiet town. – enjoying the lookout, as in the area there are a number of scenic spots, where to enjoy the wonderful views of Lake Taupo and Turangi river. Here, the main attractions are the 1200 natural representations of the force that has shaped our planet: the volcanic activity. Rotorua is also surrounded by beautiful lakes where you can swim, have a barbecue or simply walk. The landscape of the city is surrounded by volcanic hills in a dominant position, as if to protect the harbor, bays, beaches and islands that are from before. His nickname “The City of Sails” is very appropriate given the presence of numerous sailing boats which crowd the harbor giving it a romantic atmosphere. – hiking to the Mount Eden Domain and enjoy a spectacular view of Auckland City from the top of Maungawhau. I love Rotorua, it really is nature at its finest.